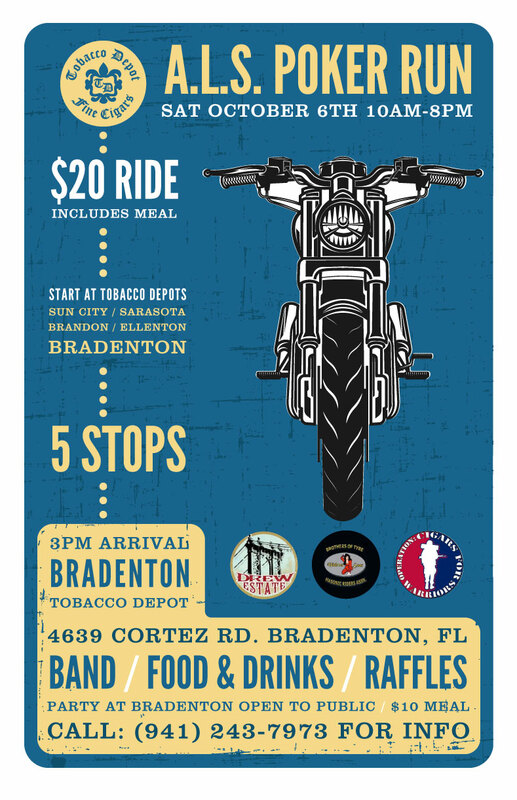 On October 6th from 10AM-8PM, gas up the bike and come down to Tobacco Depot for The A.L.S. Poker Run. At Tobacco Depot Bradenton, we’ll be hosting live music from The Andy Purcell Band, several cigar raffles sponsored by Drew Estate, a Silent Auction at 5:30PM for a 3 Day 2 Night Getaway to North Carolina, a Grand Prize Giveaway at 8PM, and more! This event is sponsored by Brothers Of Tyre, Cigars For Warriors, Tobacco Depot, and Drew Estate Cigars. We promise not to spam you, only to send good news your way about events and specials!